Credit to image used in pin goes to Wicker Paradise and Chalon Handmade on Flickr – Changes were made to the original image. As many of you know, I love doing posts on farmhouse decor ideas for the home. But honestly, I’ve never focuses on the kitchen. I mean, the kitchen is the heart of the home, where we prep and cook tasty meals. It makes sense that we should spend a little time and effort in making it look great. And what better way to decorate it than by creating the fixer upper style. And having said, down below I gathered some amazing farmhouse decor ideas that’ll turn your kitchen into a cozy farmhouse inspired space. They’re all easy to do DIY projects that’ll save you time and money. So check them out and let me know what you think! Save your counter or table space and try making this farmhouse style organizer. Just use screws and glue to attach 3 enamel mugs to a reclaimed piece of wood, and hang on your kitchen wall. It’s such a great way to keep simple things like a dish towel, or other kitchen items, in an easy to reach place. One of the easiest ways to add the farmhouse style to your kitchen is by adding some chicken wire to your cabinet. All you have to do is remove the mirror on your cabinet doors and replace with chicken wire. Staple the chicken wire panel to the cabinet door frame and enjoy your new kitchen storage. Organize your coffee, creamers, and cups with this DIY coffee station that’s made from pallet wood. You’ll just need a clean and dried pallet, some hooks and screws, and a faux wood grain paint. Assemble and paint, and in no time, you’ll have a decorative and functional coffee station. Changing your kitchen light fixtures with a farmhouse look can get expensive. However, you can easily do it yourself without spending too much money. And to make one, just get a wire laundry basket from the Dollar store, spray with copper paint, then flip the basket upside down, and attach the light inside. If you’re planning to create an indoor herb garden for your kitchen, then try using a galvanized bucket as the planter. More than just decor, it’s also a fully functional pot perfect for your little kitchen herb garden. Turn your plain and boring kitchen jars into something rustic and cute by simply applying some white spray paint and then distressing with sandpaper. You can also stencil each jar to easily figure out which one is the sugar, coffee, and tea. With just some hot glue and jute, you can easily create farmhouse placemats that’ll make a great addition to your table. Just form a firm coil shape before adding glue to lock the jute. Let it dry for a few minutes and you’ll have a decorative and functional piece. Whether you want to serve your guests hot coffee or some healthy snacks, this DIY rustic tray will definitely wow them. To make one, you can use an old cutting board, or a new one that you stain and distress, and just add rustic looking handles. They’ll look appealing and perfect for your farmhouse kitchen. If you have a bar in the kitchen, then these bar stools are a great addition. You just need to spray paint the legs or the whole stool (optional) with a copper paint color, then let them dry for few minutes. To complete your farmhouse inspired kitchen, consider adding a rustic wood sign. All you need to is to get a banner-shaped wood board and then paint with solid white color. Print off your farmhouse letters or text that you want in the largest font possible and turn them into stencils. Use black paint to fill them in and let them dry for few minutes. Hang on your wall and you’re done! Alright, whether you’re just trying out some vintage looks or give your kitchen a cozy farmhouse vibe, these DIY projects will definitely help you a lot! They’re easy to follow and will make your place look great in no time. So give them a try and let me know what you think! 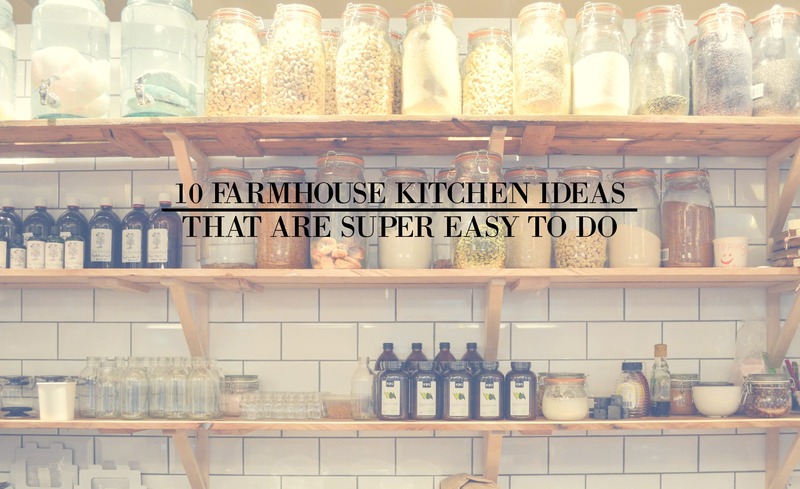 Now if you have any farmhouse kitchen decor ideas yourself, let me know in the comments down below! I might just add them to the list!